On her way to visit migrant families in Texas last week, First Lady Melania Trump sported a Zara jacket with the phrase "I really don't care do u?" emblazoned on the back. The choice of apparel ignited a controversy regarding the administration's attitude towards the migrant families. 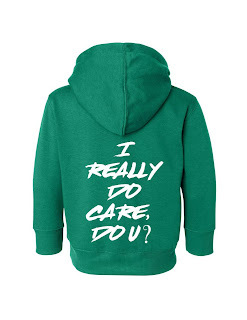 It also prompted many celebrities to respond by printing various "I really do care" phrases on the back of their own jackets and led to at least two federal trademark applications for similar phrases (although they don't appear to be filed by celebrities or major apparel companies). On June 22, a joint venture in California filed an application to register the words I REALLY DO CARE, DO U? as a trademark for various athletic apparel (see specimen submitted with the application above). 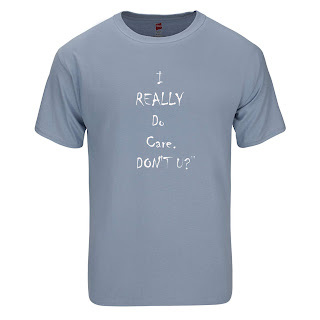 Additionally, on June 23, a corporation in Florida filed an application to register I REALLY DO CARE. DON'T U? as a trademark for various apparel (see specimen submitted with application below). Unfortunately for these applicants, their slogans will likely be refused registration on the basis of ornamentation. Merely decorative subject matter, which does not identify and distinguish an applicant's goods, does not function as a trademark and therefore cannot be registered as one. See TMEP 1202.03. Slogans or phrases used on items such as t-shirts and sweatshirts are routinely refused registration because "purchasers will perceive [them] as conveying a message rather than indicating the source of the goods." TMEP 1202.03(f)(i). When you see the phrases on the shirts above, do you see a message being conveyed? Or does it tell you the source of the shirt? If you see a message being conveyed, rather than the source of the shirt (i.e., Nike, adidas, Hanes), the use is probably ornamental, not trademark use. We'll see what the examining attorneys assigned to review these applications at the USPTO think in about three months.